Not a lot to update this week, but I've got a few things. Lindsay and I had a nice weekend: we swung by the Midsummer Renaissance Faire in Bonney Lake, WA. While we were there, we caught a couple fun acts and bought some costume pieces. It was nice, though a tad smaller than the ren faires we're used to. Growing up on the East Coast spoiled us, I guess. Pivoting from a faire to Walmart, we came across these figurines. 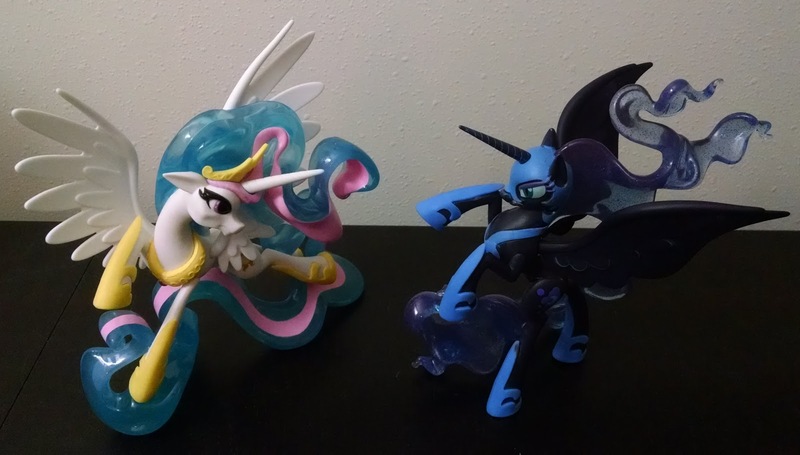 Friendship is Magic is one of many animated series we both enjoy, and these might be the nicest collectibles I've seen from the show, at least at this price point. I threw together a very brief review with some additional pictures over here, if you're interested. Shifting gears to movies, we caught Suicide Squad on Sunday. While I can definitely appreciate why the vast majority of critics tore it apart, I had a much more favorable reaction. The movie's got flaws - major structural ones, in fact - but unlike its dour predecessor in the DC Expanded Universe, this one was actually fun. If you want more details on that, check out my review at The Middle Room. Be the first to know about release dates, discounts and more!